Undergraduate advisers, who act as both peers and mentors, hold regular floor meetings to help foster a sense of community among floormates. The new undergraduate advisors packed into Brace Commons to begin their fourth day of training for an exercise called “behind closed doors.” Each of them must open a door without knowing what they will find behind it, and apply their knowledge of College regulations and protocol — as well as their own intuition — to respond to the scenario. “It’s always the most emotionally draining part of UGA training, but also the most important and informative,” second-year UGA John Damianos ’16 said. “Behind closed doors” is just one example of several training modules that UGAs must complete to be certified each September. During an intensive, week-long training, UGAs participate in activities designed to educate them on all aspects of residential life, as well as prepare them for any potential situation. These students act as peers, mentors and advisors, and are a constant presence in the lives of fellow undergraduates living on campus. Tasked with enforcing College regulations encompassing everything from possessing alcohol to lighting candles and playing loud music in dorm rooms, undergraduate advisors are a close link between the policies adopted behind the doors of administrative offices and the students who those policies affect. Consequently, UGA training functions as a window through which to view changes in College policy as a whole, and an individual UGA can be viewed as a microcosm of larger-scale administrative action. Due to the range of skills required of UGAs, the preparation they receive does not remain static. The past decade at the College has been rife with administrative and social change, and training for undergraduate advisors has been fine-tuned and tweaked as a result. The College began to test first-year-only residence halls beginning with the Class of 2004, and soon adopted a first-year housing program, creating communities — or clusters — of all first-year students for the first time in the College’s history. This in turn demanded increased UGA specialization, and two categories were created: First Year Residential Experience UGAs and upperclassmen UGAs. Damianos says that an essential component of UGA training under FYRE is the concept of radical hospitality — creating inclusive communities for everyone — while upperclassmen UGAs are taught motivational interviewing, a conversation style that functions as a means of counseling. Aside from the housing overhaul that grouped first-years exclusively with their peers, associate director of residential education Jeffrey DeWitt said most adjustments to training have occurred over the past three or four years. For DeWitt, UGA training can be viewed as a reflection of larger institutional aims. “[The recent changes] very much are in response to institutional priorities,” he said. The past decade has seen three different College Presidents, and DeWitt ties the recent changes to the tenures of College President Emeritus Jim Kim and College President Phil Hanlon. Additionally, when a particularly current issue or possible crisis that may affect campus surfaces, UGAs must be trained to respond. DeWitt said that during the H1N1 outbreak in 2009, for example, UGAs were trained to respond to the possibility of a global pandemic. A few years ago, UGAs were given one-time targeted training for how to respond to a campus shooter. Not all modifications are inspired by potential crises, however, as many changes have occurred simply due to the addition of new staff members who bring ideas from other institutions, Dewitt said. UGAs also receive bystander intervention training to bolster responsiveness to time-sensitive real-world scenarios. “You don’t really know how much you need to know until you have someone in front of you,” East Wheelock community director Josiah Prioretti, who oversees all UGA training, said. With an increased awareness of mental health nationwide comes a strengthened focus on the mental health of college students specifically. College students, after all, must navigate a particularly transitional, stressful period of life. The most recent change to the UGA program has been the implementation of Campus Connect — a new suicide prevention program that began last year and trains students and campus personnel on how to recognize warning signs of suicidal behavior. UGAs also receive first-responder training, and they are educated in topics including social justice, diversity and inclusivity. While many typically associate UGAs with cracking down on students, Prioretti maintains that this is not their primary role. “We have made great progress in helping our students understand that when they are checking in with students with dangerous behavior, it’s really a lot less about punitive stuff and a lot more about care and concern,” Prioretti said. Damianos echoed Prioretti’s sentiments, and said that for him it is a misconception that UGAs primarily crack down on social events. In addition, UGAs — by definition — are more than just resources and leaders in their community. UGAs are campus security authorities, a term specific to the Clery Act that denotes someone with significant responsibilities for student and campus safety. As campus security authorities, UGAs are required to report all violations of the law to the College. Despite these changes, DeWitt, who has been at the College for 17 years, says that when looking at the big picture it is remarkable how little things have shifted. 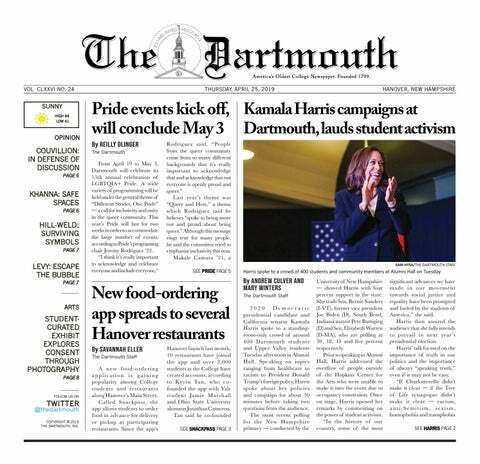 Undoubtedly, the changes that will come with Hanlon’s “Moving Dartmouth Forward” plan will affect UGAs’ daily life, as new policies like the hard alcohol ban will require them to adapt their enforcement policies and role as campus security authorities. Russell Sage UGA Sigan Chen ’17 speculated that big changes are in store for her fellow advisors in terms of policy enforcement. Second-year UGA Cynthia Madu ’15 said that the possibility of higher expectations for strict enforcement by UGAs frightens her. Damianos, who was a member of the “Moving Dartmouth Forward” presidential steering committee, said that the main role of UGAs is to foster community, and that this will only be improved by the plan. While policy enforcement and reduction of harmful behavior are essential components to being a UGA, it is understandable why some UGAs feel uncomfortable with a heightened role in student social lives. Chen says she thinks the new policy will have an impact on whether potential future UGAs want to take the job or not. Madu also believes that “Moving Dartmouth Forward” could have an adverse impact on how UGAs view their responsibilities. In addition to the hard alcohol policy, the implementation of the residential college system will cause a shift in the tenor of residential life and a corresponding reverberation in the role of UGAs in their communities. What is certain, however, is that UGA training and responsibilities will continue to serve as a useful barometer of swings in campus climate.